RIE also recognizes that if a child chooses to share, it should be an authentic expression of his wishes, so we don’t want to unduly influence or encourage sharing, either. It should happen naturally. Still, I’ve seen even the most dedicated RIE parents secretly celebrating when their child shares with another, or complimenting another parent for how well their children share. Ironically, it is true that when children are not forced to share, they end up sharing more openly and freely with others. Some RIE parents are attracted to RIE because of this very fact. After all, isn’t sharing more openly and freely good? However, sharing is not a virtue — nor is it a vice. The concept of sharing means choosing to let someone else use something you have or that is yours. It is a morally neutral concept. Sharing is really about the personal connection and exchange of values (spiritual or otherwise) between two individuals. That is not something that can be forced or taught. If I want to share something with you, it’s because I want to share it with you. And it’s because I want to share it with YOU (yes, you specifically, not someone else). It is not because I want to “just share it.” This paradigm shift helps us better understand and identify what is actually happening when our children do share. How do you know if you’re focusing on the values and not sharing as such? Try to observe what is happening without using the S-word. That will usually force your mind to see the values and not the sharing (or lack of sharing, e.g., “Sally wanted to take the truck, but you wanted to keep playing with it”). With this approach, even the act of not sharing is transformed from something seemingly negative into a positive, value-recognizing opportunity (“Johnny wants the balls but Jack is really focused on working with them right now”). This will help you identify what both parties want, which is crucial to problem solving should there be a conflict over “sharing” something in particular. Still, as parents, it can be hard to break the desire for our kids to share. It just feels nice, doesn’t it? But when we put, even if only secretly in our own minds, some kind of expectation of what the child *should* do, they pick up on it. RIE parents want their children children to act authentically and their choices to come internally from within themselves, not others (including their parents). Our reactions should be no different, whether a child chooses to share something or not. In this example, we should have no more — or less — pride in our child valuing to get on the ride than her offering it to her friend. Our pride, as parents, should be reserved for the fact that our children are making their own value judgments and their choices are coming from within, i.e., are authentic. Our goal should not be to produce sharing children, but rather to foster authentic children who are respected and, incidentally, happen to share pretty well. Contrast this with a forced (or even highly encouraged) sharing approach: from the child’s perspective, it’s the difference between having one’s values recognized or having them taken away. 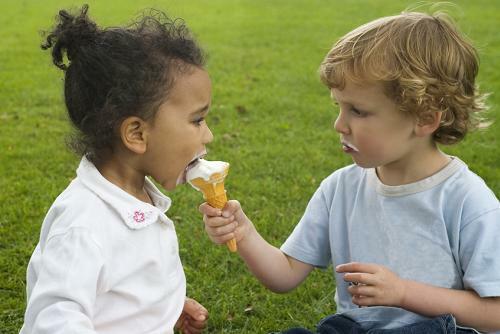 Most important, when a child shares, or chooses not to share, it is an expression of his inner-most wants, desires, and chosen values. Let’s focus on those values — and celebrate them.